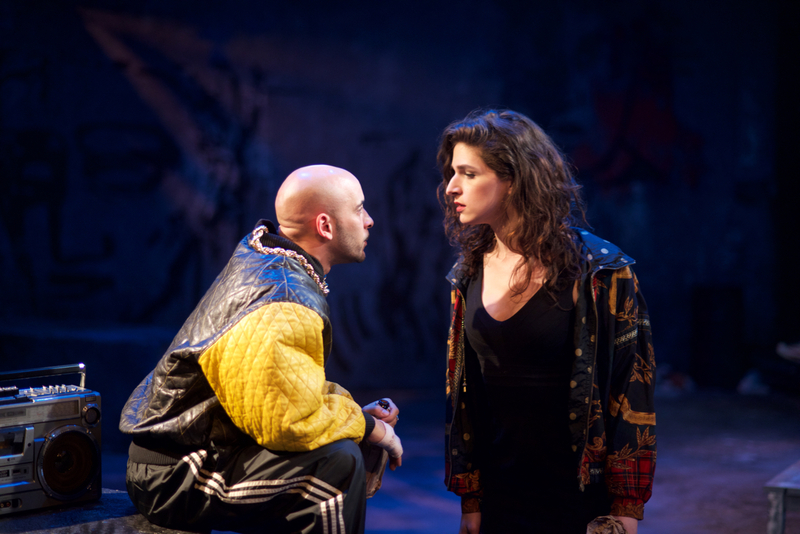 It seems highly appropriate that The New Ohio Theatre, located on the far west end of New York City’s famous Christopher Street, is the venue for Vertigo Theater Company’s stunning new production Street Children, now enjoying its World Premiere. 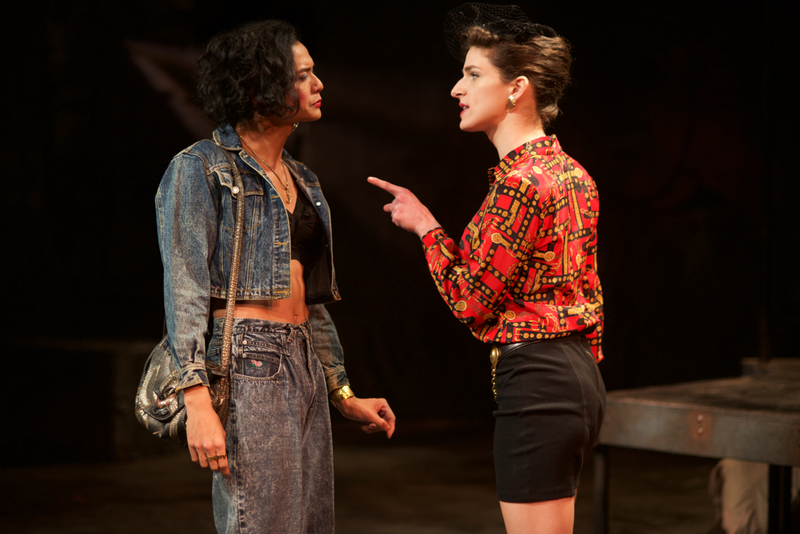 The play, written by Pia Scala-Zankel and directed by Jenna Worsham, is a provocative look into the lives of a family of LGBTQ youth who congregated at the lower Hudson Piers in the late 1980’s. At that time, the Piers were in a state of decay, and had the reputation for being a hotbed of prostitution, drug use, and violence. In 2017, after decades of cultural and physical changes in New York City (including the gentrification of many neighborhoods), the era depicted in Street Children may now seem like ancient history. But for those who remember seeing the young people breakdancing, voguing, and carrying their boomboxes alongside the West Side Highway, it may seem more like “just yesterday”. From the scenic and sound design, to the extraordinarily detailed costume design (leg warmers, acid-washed jeans, homemade air-brushed T-shirts, old school Nike high tops, “big hair”, thick gold chains… It’s all there! 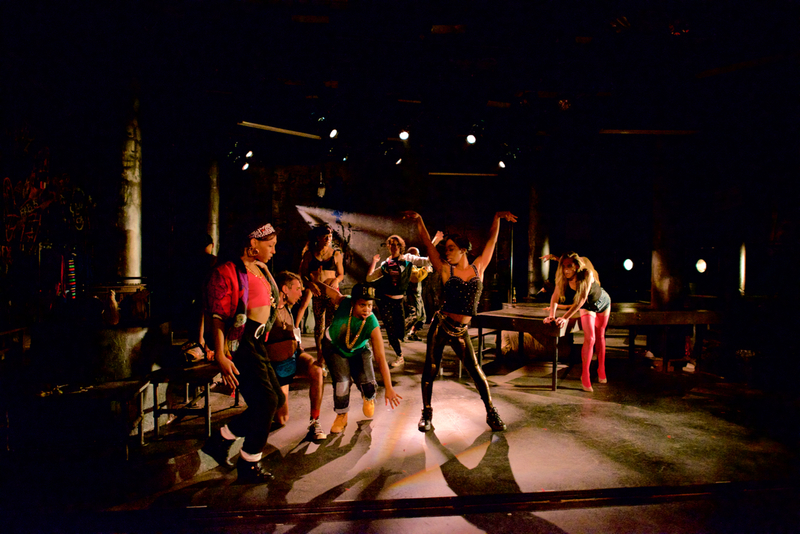 ), to the authentic dialogue and portrayals by the cast, Street Children vividly recreates the underground urban subculture of its unique characters. For these marginalized youngsters, the highly anticipated “balls” were a celebration of otherwise forbidden self-expression: a chance to revel in all their flamboyant, over-the-top glory. It was also a chance to temporarily escape from a much darker reality. Many of these these LGBTQ teens and young adults were rejected from their families. Many were homeless, and many were squeezed into bartering with their sexuality for survival. The young people faced alienation from society, poverty, and the threat of violence— all of which are severely depicted in this new play. There is also a pending storm which hovers over the setting, although it is never mentioned by name: One of the characters refers to “that gay disease”, and another shows telltale purple spots on her face. We meet the main characters of Street Children. Jamie (Eve Lindley) is a 21-year old transwoman whose doe-eyed face expresses years of pain but also a shimmer of hope for something better. Angela (JP Moraga), self proclaimed “Queen of the West Side Highway” and also a transwoman, is is feisty and sharp-tongued. She’s also become quite hardened. Jamie and Angela turn tricks for money. Terrence (Victor Almanzar) is the tough-acting “banjee boy”. The three are members of the House of Diamonte, and they live together in a tiny apartment with three mattresses on the floor. They are indeed a family, brought together by circumstance rather than genetics. 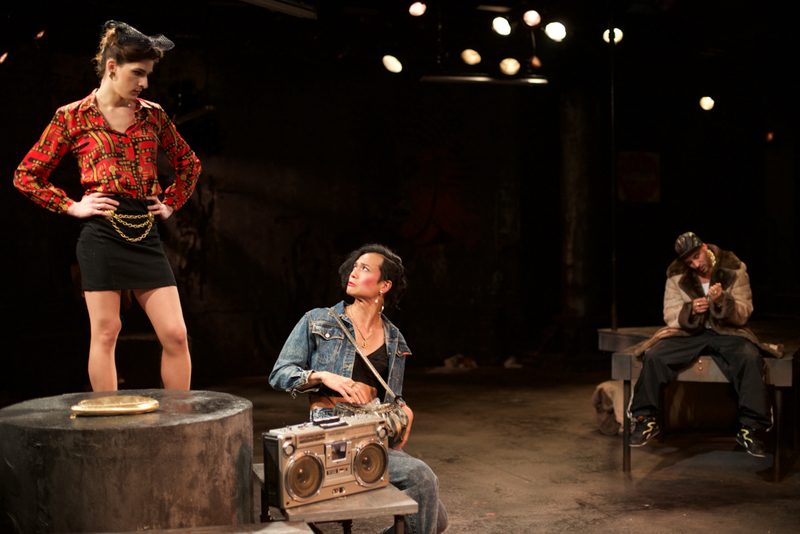 At the opening of the play, the three are mourning the recent death of their beloved House Mother Gina (played by Mj Rodriguez in flashback scenes and hallucinations), who was beaten to death. Occasionally, the three venture out of their fragile sanctuary into the outside world, with less-than-welcoming results. Jamie and Terrence pay their respects at Gina’s funeral, where they learn that Gina’s family were in denial about her life; they still identified her as male. Angela reverts back to her former male persona Felix and goes to her childhood home to visit her scrappy younger sister Lala (Yadira Guevara-Prip), with a dispiriting outcome. Terrence faces internal conflict over his sexuality, and that conflict explodes in a severely violent encounter with a hunky go-go boy (Johnny Sibilly) at an after-hours club. All of these scenes hit the audience with the power of an oncoming train. The characters of Jamie, Angela, and Terrence are multifaceted and fully realized; none of them ever drift into caricature or stereotype. 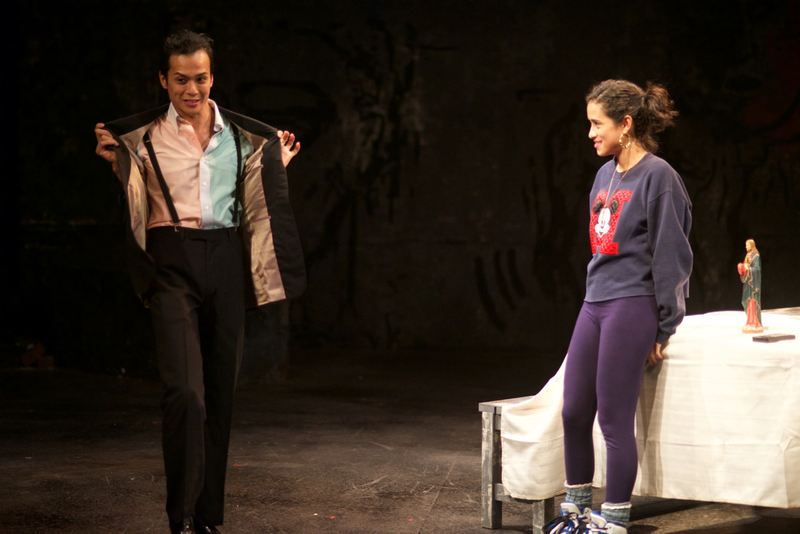 The acting of both the main and supporting cast is superb and fearless, and their performances are enhanced by a young, energetic, and diverse chorus. We feel the joy when these “street children” dance to Whitney Houston and Evelyn Champagne King . We laugh as they throw shade at each other with lines like “I am so glad we make you feel good about yourself— because somebody has to!” and “Chanel don’t take food stamps!” Most importantly, we feel their pain. We feel it so much, in fact, that we long for some kind of happy ending for these kids. While one of the main characters meets with tragedy at the end, there’s some very palpable hope for the other two. And, like everything else in their young lives, that hope doesn’t come easy. Previous “Eight Days of Christmas”? How About… “Eight Questions for Tym Moss”! Next Make 2017 “The Year of The Cowboy”: Meet the Men of HomoRodeo.com!